The Dressage Foundation is pleased to announce that Emily Wagner of Overland Park, KS, and her American Warmblood stallion, WakeUp, have been selected to receive this year's $25,000 Anne L. Barlow Ramsay Grant. The purpose of the Grant is to showcase talented American-bred horses ridden by United States citizens, by providing money to train and compete in Europe. Emily and WakeUp won the 2011 National Championships for six year olds, finished as 2012 Reserve Champion in the Developing Prix St. Georges division, and in 2013 won the Championship title. This year, the team was Regional Champion in Intermediate B and Grand Prix, and nationally WakeUp and Emily were Reserve Champion in the Developing Grand Prix Finals. To further their development and reach their goal of becoming a successful international Grand Prix team, Emily and WakeUp plan on training with Elmar Schmiehusen this winter in Warendorf, Germany. Emily also hopes to compete with WakeUp in CDI’s at Verden and Neumunster. "I am beyond excited and thrilled that WakeUp and I have been chosen to receive the Anne Ramsay grant to train and compete in Europe," said Emily. "I feel WakeUp is at a pinnacle moment in his career. He is strong, fit and comfortable in the Grand Prix work. This opportunity for concentrated training in Germany will show us that next step forward to precision and brilliance. I feel so lucky to be able to ride such a fantastic horse and proud that he can represent horses bred in the United States. Thank you so much to Dr. Ramsay and The Dressage Foundation!" 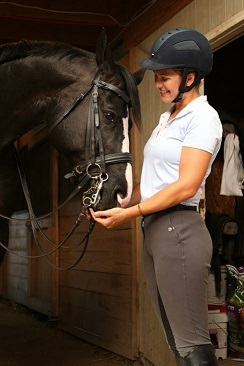 Dr. Anne Barlow Ramsay (FL) established a Charitable Remainder Unitrust with The Dressage Foundation in 1999. The remainder funds were designated to come to The Dressage Foundation ten years later and those funds were used to start the Anne L. Barlow Ramsay Grant. In 2009, Dr. Ramsay established a second Charitable Remainder Unitrust, with the remainder funds coming to The Dressage Foundation in 2019, to continue her schedule of $25,000 annual grants into the future years.